SAL DeTRAGLIA'S VIRTUAL TAPAS BAR: MORE DYC, ANYONE? 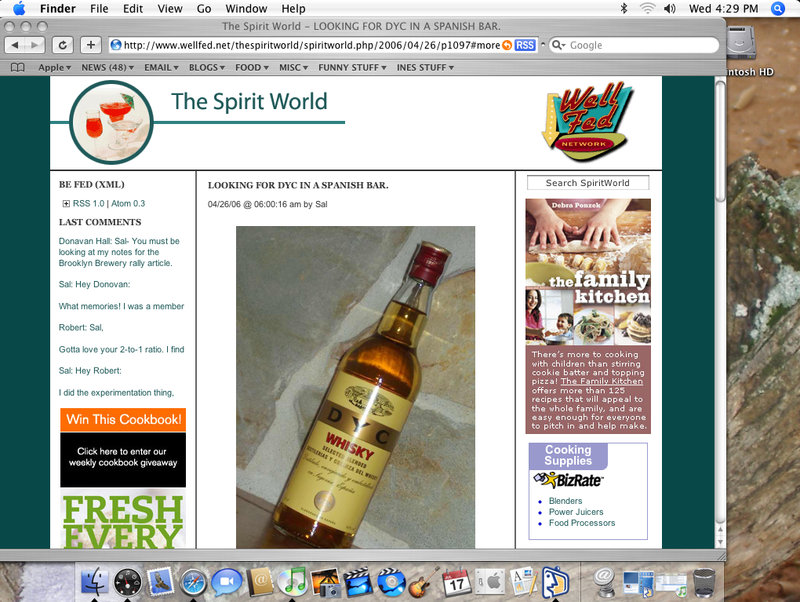 My scholarly dissertation on Dyc—Spain’s most pitiful excuse for a Scotch whiskey—is now published in The Spirit World. For those astute readers who've noticed that this essay includes "recycled" material, just remember...One man’s laziness is another man’s synergy. My Turkish wine of choice last year ... ('choice' being suitably emphasised so as to emphasise the 'lack of' ) was Dikman. I used to mumble the word or create a safe and comfortable context ... or just as easily, not speak it, happier to mention the first Turkish year with the Do Luca red (sounds like Dolluja). recycled stuff - not to worry. i dont know of a writer whose not guilty of it. Does one you start acting like a DYKhead after a few shots? Lady Di: That makes perfect sense. They certainly couldn't name it "Dikwoman." Sophie: Yeah, I guess it is OK...as long as you're not recycling someone else's stuff. Right Dan Brown? PS: We both loooove single malts, so we'll stick to them. God, I'd almost forgotton about 'tubos' and a four finger cubata.... I can't imagine how- when I returned to the US after my five year vacation (oops, I mean ....ok, vacation sums it up pretty well) I had the hardest time in the world getting used to US mixology. Hell...I felt down right Alchoholic everytime I'd ask for a triple rum and (no damn Kas or Schweppes Limon here either) coke. 'A triple??" they'd ask "Boy, you must have had a hard day". It was not worth going into the fact that I had basically learned to drink booze and coffee in Spain (Mom still will not let me make coffee in their house), and had been hopelessly corrupted. 2 cubes, 4 fingers- and the ever present 1/2 slice of lemon. Viva España!! Memories ... after 4 years as an airforce wife with access to very cheap alcohol and/or of pouring my own whisky, I was stunned and horrified to learn I had been drinking many nz$ worth per glass ... or that's what they tried to tell me when I gave them an example of what turned out to be 4 shot glass in a nightclub ... children, don't try this at home. It's all about not having to refill for hours of course ... as if a Kiwi would drink to excess. Any chance you could write about Potcheen for The Spirit World? I saw it on the shelf at my favorite liquor store. I'm also waiting to read what you have to say about Spanish brandy. Have any of you tried the new Coca Cola Blak? Is it available in Spain/Europe. For those not familiar, it's coffee flavored Coke. Maybe Whisky Dyk could help it out. Junior Pfeff: Of course I could write about Potcheen for TSW. I can write about whatever I want, as my last post proves. The only problem is that it will require research (well...not really a problem, I guess). Potcheen is an Irish liquor, and I've never seen it here. I had it once, when I was in Limerick on business. The problem was that I had my glass of Potcheen after already having seven pints of Guiness. Let's say that the subtlties of its essence was lost on me by that point. Sidenote: The next morning, I had to give a series of Insider Trading lectures to employees and then fly to London. I wasn't exactly at my best. Iron Man: How could you possibly forget about the four-fingers [of death] method of Spanish mixology? It's usually the first thing that tourists notice. DJ Jazzy G: Coffee flavored Coke? As if Coke didn't taste bad enough in its original state? No, Coca-cola Blak isn't available here. I'd suspect, in fact, that it won't even make it out of Peoria. But when/if it does become available in Spain, I'll be sure to drink it...but without the Coke.